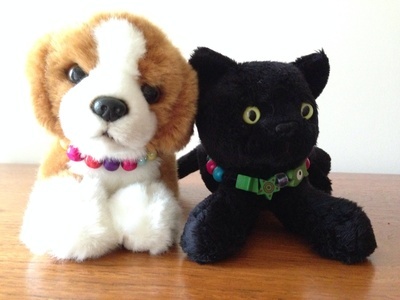 Here's how to make a colourful beaded collar for a favourite soft toy. It can also be used as a bracelet. 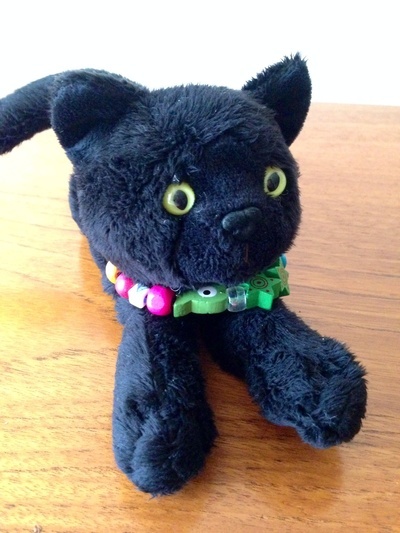 We did this as a 5th birthday party activity - instead of party/lolly bags the girls were given a small soft toy kitten which they could take home at the end and they made the beaded collars for their new pet at the party. Measure the elastic to the right length for your soft toy then add a few extra centimetres. It works well if it's about the same size as the child's wrist so that the collar can also be used as a bracelet. Tie a knot at one end of the elastic so that the beads can't slip off. For younger kids, you may want to tape this end to the table top to make the beading easier. 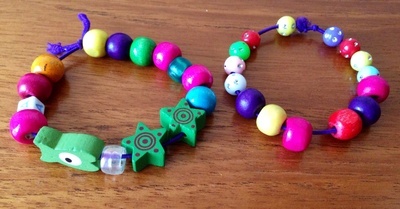 Lay out some bowls of colourful beads and let the children thread the beads onto the elastic making their own designs. When finished, tie the two ends of the elastic together to make a bracelet and tie a secure double knot. Trim the loose ends. Your beaded collar is now ready for your new pet.